It’s a sad indictment on Western society but, according to research published in the United States last August, loneliness and social isolation kill more people than obesity. It’s suggested they may increase the risk of premature death by up to 50%. In January this year, the Prime Minister announced government plans for tackling this modern epidemic. A Minister for Loneliness has been appointed (Tracey Crouch, DCMS’s Minister for Sport and Civil Society) and a cross-governmental strategy is due to be published later this year. The PM quoted recent research which revealed that more than nine million people - about a fifth of the UK population - reported always or often feeling lonely. And around 200,000 older people had not spoken to a friend or relative for more than a month. Earlier UK research had already demonstrated that lacking social connections could be as bad for the health as smoking 15 cigarettes a day. Conversely, social networks and friendships are thought to reduce the risks of developing certain diseases, and aid recovery from illness. There are two very important factors to flag up - first that loneliness can affect people of all ages, and second that loneliness and social isolation are not the same thing. The latter is defined as a lack of contact with people, while loneliness is feeling disconnected from others. So you can feel lonely even when you’re not alone. Libraries combat both loneliness and social isolation and are ready, willing and able to do more. Nationally, roughly half of the adult population use public libraries, including 43% of people over 55. So the government needs look no further to find a remedy. It’s not rocket science - just common sense: protect and enhance the existing library network, and possibly look to refocus some services. 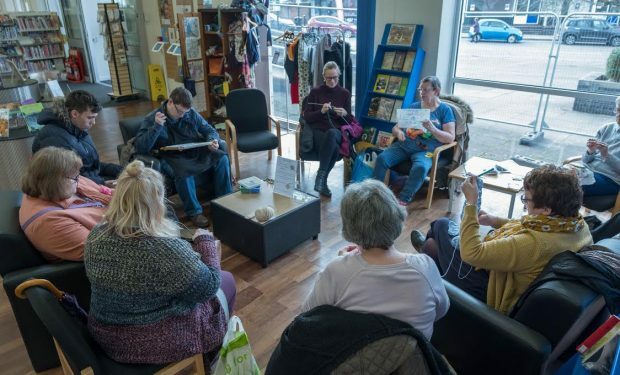 The Taskforce published a blog post recently by City of London libraries about this topic, and it highlights how library staff have been working with the Corporation’s lead on loneliness and social isolation. As the strands of its Social Wellbeing Strategy are rolled out, the City will look to its libraries first as the place for new activities to be located. A research report published for Mother’s Day, found, for example, that one in five young mums always feel lonely. Rhymetime sessions in libraries, although aimed at babies and toddlers, are an important place where new parents can meet and socialise. I’ll give a few quick examples from my own library authority, Warwickshire, where health and wellbeing have long been high on the agenda. I’m sure it’s a similar picture elsewhere. Our libraries support all kinds of get-togethers such as Silver Surfer computer sessions for the over-50s, coffee mornings, Knit and Natter clubs, and reading groups. Recent introductions include Betty’s Board Games - fun mornings of Scrabble, Monopoly, chess and draughts - and two new library ‘makerspaces’ offering people of all ages the chance to play - and get creative - with the latest digital kit. The local population is ageing at an above-average rate and, some years ago, Warwickshire developed a One Front Door strategy so that people could find other services they need - such as making Blue Badge or concessionary travel applications - at local libraries. We are also making our libraries dementia friendly and training staff accordingly. Hundreds of volunteers - many but not all older people - make social connections through supporting library staff and services across Warwickshire. The volunteers make a valuable contribution, and meet new people and make friends at the same time. We also have one of the most extensive housebound reader services in the country - which takes books and human contact to those unable to leave their homes. I saw the value of outreach services early on in my career, when I worked on a mobile library - an experience that left a lasting impression. Weekends can be isolating for all age-groups so, despite continuing financial pressures, the Council’s Cabinet recently voted funding to maintain Sunday opening hours in our larger libraries. It’s all part and parcel of what libraries do - and have always done. We provide comfortable, warm and welcoming public spaces for all-comers. So no-one needs to feel cut off from the world. In these increasingly online times, when so many people live - and work - alone, libraries are ever more important. Social interaction is a habit we cannot afford to lose - and it seems our health and wellbeing depend on it.